Henry Trigg, a Hertfordshire grocer, was both wealthy and eccentric, owning considerable property within and around the town of Stevenage. One night, after a bout of alcoholic celebrations with two of his colleagues, his route home took him by way of the local churchyard. Attracted by noise and the sight of flickering lights coming from within the church grounds they made their way to the surrounding wall and peered over. They were somewhat disturbed by what they saw .... resurrectionists about their nefarious business. These were in fact bodysnatchers, removing the remains of the newly buried for sale as research items to surgeons and students training at medical school. The sight had such an effect on the three friends that they all made a pact that they would take suitable steps to ensure that such a fate did not befall their cadavers after their own individual deaths. After his death in 1724 his brother, The Rev Thomas Trigg, put aside any scruples that he may have had and agreed to fulfil Henry's request. The remains were duly sealed in a coffin and placed in full view in the appointed location. And there they remain until today ......or do they? In her will of 1769 his niece Ann left the sum of forty shillings to provide her uncle with a decent burial. There is no record however which shows that this was ever done. In 1774 the house became the Old Castle Inn and the barn (and presumably its occupant) escaped a series of disastrous fires in the area. In 1831, a new landlord Mr Bellamy, took over. His first task was to inspect the coffin. Henry, he confirmed, was still inside (What happened then to Anne's forty shillings?). A further check was made in 1906 when members of the East Hertfordshire Archaeological Society were allowed access to it. Their report shows that the coffin contained about two thirds of a human skeleton. In 1917 a lady reported that she, along with two of her friends, made a nocturnal visit to the coffin. They found a small hole on the base into which they put their hands. Groping inside they removed bones which subsequently turned out to belong to a horse. 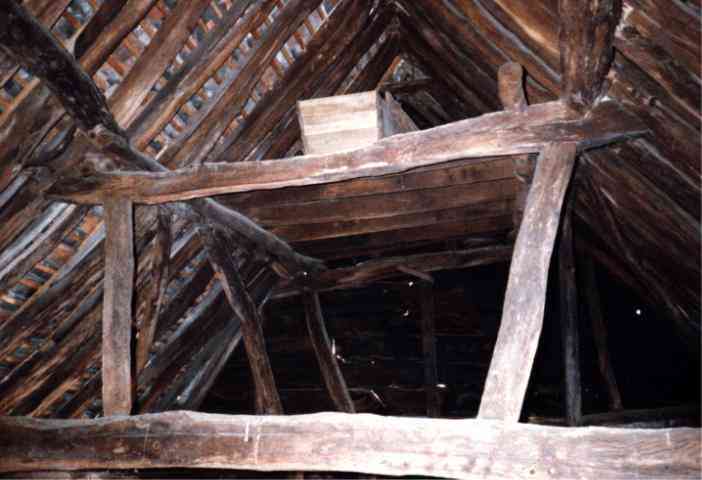 The coffin still remains in situ in the rafters of a building now owned by the National Westminster bank, at 37 High Street, Old Stevenage.